Next week my cousin Michael is marrying his partner Jessica in Adelaide. I am lucky enough to have been able to rearrange my work schedule and make the trip down for the wedding, I can't wait! So today I made my favourite cousin a Wedding card. I had a very clear picture in my head of what this card was going to look like, however the result is nothing like what I planned. Still happy with the final outcome though. The stamp I used is "Just Married" from Fern Gully Stamps. They are an Australian company. When I was a sales rep for Kidston Crafts I was lucky enough to visit their Victorian store. Needless to say I think I bought more from them than they ordered from me that day. The papers are from Prima Marketing's Reflections Collection. 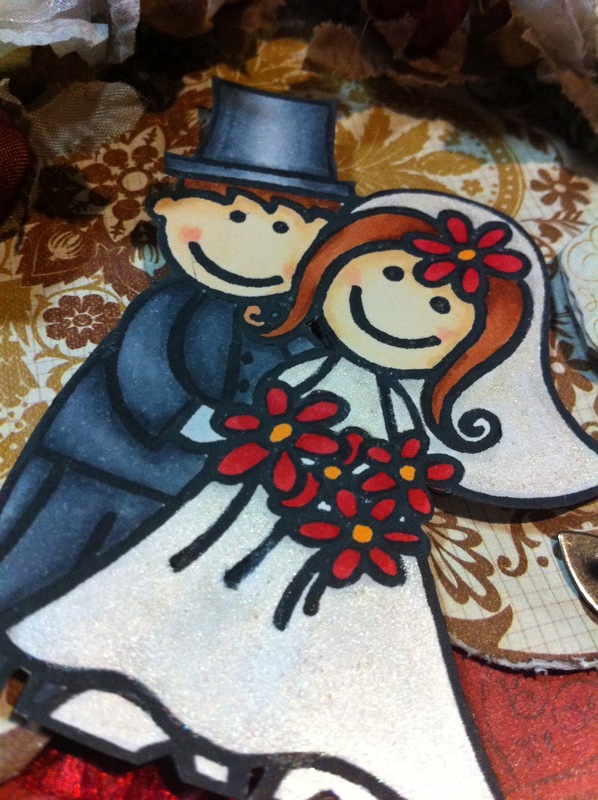 I used a rub-on from Making Memories "for the bride and groom". I did have a really cool tag for here instead - a swing tag from something I bought at Colorado. Unfortunately when I stamped on it the image didn't work so I had to come up with something else. The metal anchors are from Bumblebee Crafts and the flowers and ribbon are from my ever growing stash. You can see a hint of the Twinkling H20's in this pic. Such a cute couple... just like Michael and Jess. Yes I can see the twinkle on her dress, makes for a perfect wedding dress. Great card. Thank you for joining us at Divas this week. this is such a cute wedding card. Thanks for playing in the Divas challenge this week. Just catching up on your cards. I love the beautiful rich colours you've used on this one and those fabulous tassles. Hope you had a wonderful time at the wedding.